The Namakaranam Ceremony of the prince gave great delight to the subjects of the state as well as the inmates of the palace, and members of the royal household. But, Yudhisthhira, the eldest of the Pândava brothers felt that something more had to be done, he was not content with the joyous festival alone. He called for an assembly the same evening of all the elders, the scholars, the pundits, the subordinate rulers and leaders of the people. He prayed that Lord Krishna preside over the gathering and confer joy on all. The sages Vyâsa and Kripa also attended. Coming to the assembly, Yudhisthhira stood before the gathering a few seconds in silence, before he fell at the feet of Lord Krishna and sage Vyâsa. He then turned towards the rulers, scholars and leaders and said, "I was able to defeat the foes through your help, cooperation and best wishes, as well as the blessing of the Lord who is present here and of the sages and saints who have installed Him in their hearts. We were able by means of that victory to win back the kingdom that we had lost. Again, through these blessings, the light of hope has gleamed in hearts, darkened by despair about the continuation of this dynasty. The Pândava line will be continued by the prince who was named today by the Lord as Parîkchit. While all this delights me, I must announce before you that I am overwhelmed with sorrow at the contemplation of another side of the picture. I have committed countless sins, killing kith and kin. I feel I must do some expiation for this; or else, there will be no happiness for me or for my dynasty or for my people. Therefore, I wish to take this opportunity to seek your advice on this matter. There are among you many who have known the reality and attained Brahmajñâna; we have also the great sage Vyâsa here. I expect you to suggest some expiatory rite by which I can rid myself of this colossal quantity of sin that I have accumulated as a result of this war." When Yudhisthhira posed this problem in great humility and with great contrition, Lord Krishna said, "Yudhisthhira, you are famous as Dharmaraja and you ought to know dharma. 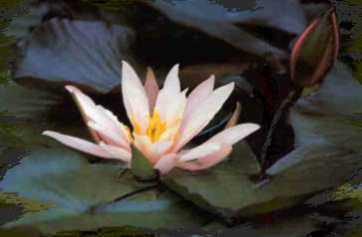 You know the intricacies of dharma and morality, of justice, of right and wrong conduct. Therefore, I am surprised that you are afflicted with grief over this war and this victory. Do you not know that a kshatriya incurs no sin when he kills a foe who has come to the battlefield armed with intention to kill? Whatever injury or pain or loss is inflicted on the battlefield during the fight with armed foes is free from sin. It is the dharma of a kshatriya to take up the sword and fight to the very end, without any thought of self, to save his country. You have only observed your dharma. How can karma (activity) along the lines of dharma be sinful? It is not proper to doubt this and give way to despair. Sin cannot touch you, surround you or bother you. Instead of exulting over the festival of the naming of the new-born prince, why should you dread imaginary calamities and seek remedies for non-existent sins? Be calm, be happy." Vyâsa too rose from his seat and addressed the King. "Sinful and blame-worthy acts are inevitable in battle. They should not be the cause for grief. The chief aim in battle should be the protection of dharma from its foes. If that is kept before the mind, the sin will not affect the fighters. A putrid wound has to be treated with the knife; it is not sinful to inflict the surgery. A doctor who knows the surgery, and knowing, does not save the man by doing it, incurs sin. So too knowing that the foe is the source of injustice, cruelty, terror and vice, if these boils are not treated by the surgeon, knowing the cure, because he is reluctant to use the knife (the surgeon being the kshatriya), he incurs sin by remaining quiet, not by using the sword. Dharmaraja, you are speaking under a delusion. I can understand others less wise being afflicted by these doubts, but, I wonder how you are worried over this fear of sin? If however our words do not carry conviction, I can suggest another remedy too. That will remove all fear. Some rulers in the past have resorted to it, after the conclusion of wars, for the removal of the effects of sin. It is the rite of As'vamedha, the Horse Sacrifice. If you desire, you can also perform this rite, as an expiatory ceremony. There can be no obstacle for that. But, believe me, you are innocent of sin even without any expiation. Since your faith is shaky, I am suggesting this rite for your satisfaction". After this statement, Vyâsa resumed his seat. At this, all the elders, scholars and leaders rose as one man and applauded the valuable suggestion given by Vyâsa. They shouted, Jai Jai, in order to demonstrate their approval and appreciation. They exclaimed, "o! how auspicious, how significant" and they blessed Dharmaraja in the endeavor to free himself from the sinful consequences of war. But, Dharmaraja was still heavy with grief; he was not free from fear. His eyes were wet with tears. He pleaded with the assembly, most piteously. "However much you assert my innocence, I am not convinced. Somehow, my mind does not accept your argument. Rulers who were engaged in wars might have cleansed themselves by means of the As'vamedha yaga. Those were ordinary wars; they were the usual type. But my case is something very extraordinary. My sins are three times more sinister, for, (1) I have killed kith and kin (2) I have killed holy elders like Bhîshma and Drona and (3) I have killed many crowned heads. Alas, my fate! How monstrous have been my actions?" "No other ruler could have done so much of iniquity. Not one, but three As'vamedha Yagas have to be performed to cleanse this quantity. Then, only can I have peace. Then only can my dynasty be happy and secure. Then only can the administration of my kingdom be safe and meritorious. This must be kindly accepted by Vyâsa and other elders and sages." When Yudhisthhira spoke thus, tears dropped on his cheeks; his lips quivered with sorrow; his body was bent with remorse. Seeing this, the heart of every sage melted with pity. The subjects of the King were moved in sympathy. Vyâsa and even Vâsudeva were affected. Many pundits shed tears, without being aware of it. The assembly was struck dumb with astonishment. All knew in a flash how soft the heart of Dharmaraja was. The brothers too, Bhîma, Arjuna, Nakula and Sahadeva were standing with folded palms, in reverential humility, awaiting the word that will assure relief, from the Lord who was in the Presidential Seat. Then, the assembly, with one voice, approved the three As'vamedha Yagas, to relieve the distress of Dharmaraja. One sage gave expression to the opinion of the assembly. He said, "We shall not stand in the way of your desire. We accept it whole-heartedly. We shall celebrate the Yagas in the best sastric way, until the final rites. For, we seek peace of mind for you, more than anything else. We are prepared to do anything which will give you satisfaction." This was acclaimed by every one in the gathering. Hearing this, Dharmaraja said; "I am indeed blessed; I am blessed indeed. He gave his grateful thanks for the promised cooperation. He walked towards the place where Krishna and Vyâsa were seated and he fell at their feet. He held the feet of Krishna and pleaded, "0 Madhusûdana! (killer of Madhu) name of Krishna as the one who kills the demons) Didn't you hear my prayer? Didn't you witness my grief? I pray that you grant us your Divine presence at the coming Yaga, that you ensure me the fruit thereof and save me from this burden of sin." Krishna smiled and lifted him up from the ground before Him. He said, "Dharmaraja! I shall certainly answer your prayer. But, you have taken upon your shoulders a burden as heavy as a range of mountains. This Yaga is no small affair. Moreover, the performer is the celebrated King, Dharmaraja! That means, it has to be celebrated on a scale befitting your status. I know that you have no where-withal for this very expensive undertaking. Kings derive money only from their subjects. To spend on a Yaga, the money squeezed out of them is not desirable. Only well earned money can be used for such holy rites; else it will bring evil instead of good. Nor can your subordinate rulers come to your help, for they too have been miserably impoverished by the late war. It is clear they have nothing to spare. Aware of all this, how could you accept to celebrate three As'vamedhas in a row? I wonder how you found such audacity in spite of these adverse conditions. And, you have already announced it publicly in this great and distinguished gathering. You did not give Me even a hint about this costly idea. Then, we could have thought out some plan. Well, it is not too late. We shall take a decision after some more deliberation. It does not matter if some delay is caused." Dharmaraja listened to these words of the Lord and laughed a hearty laugh! "Lord, you are playing a drama with me, I know. I have never decided upon an act without deliberation. Nor have I ever worried about money or the wherewithal. When we have as our guardian, You with Your inexhaustible Grace, why should I worry about anything? When I have the Kalpatharu (wishfulfilling tree) in my garden, why should I worry, seeking roots and tubers? The all-powerful Lord, who has been guarding us all these terrible years as the eyelids guard the eye, will not give us up, at this juncture. For You who can whiff huge mountains into dust, this little pebble is no problem at all. You are my Treasure, my treasury. You are the Very Breath. Whatever You may say, I will not hesitate. All my strength, all my wealth is You and You alone. I place all my burdens, including the burden of state and this new burden of the three Yagas on Your Feet. You can do anything you like. You may value my word and carry out my intention or You may discard it and cancel the Yagas. I have no concern. I am equally happy, whatever You do. It is Your Will, not mine." Of course, with the Lord who resides in the heart, no special pleading is needed. The Lord melted; He lifted Dharmaraja and helped him to stand. "No, I spoke in jest to test your faith and devotion. I wanted to demonstrate to these subjects of yours how strong is your faith in Me. You need have no worry on any score. Your wish will be fulfilled. If you follow My instructions, you can procure very easily the money needed for the celebration of the Yagas. You can get it without harassing the rulers and squeezing the subjects." On hearing this, Dharmaraja was delighted. He said, "Lord, we shall honor Your command." Then Krishna said, "Listen. In bygone times, a ruler named Maruth performed a yaga, in a style that no one since then could approach. The hall where the yaga was celebrated along with every item connected with it were of gold. Gold bricks were given away, as gifts to the priests who officiated; golden images of cows were given instead of cows and plates of gold were distributed instead of lands! The brahmins were not able to carry them home and so, they took only as much as they could lift or carry. The rest they just cast away. Those pieces of gold are now available in large quantities, for your yagas. You can collect them." Dharmaraja did not agree; he had qualms about it. He said, "Lord, that is the property of those to whom it was given. How can I make use of it, without their permission?" Krishna replied, "They have cast it away, fully conscious of what they were doing and what they were discarding. They are not alive today. Their children know nothing about the existence of this treasure. It is now under the earth. Remember that all treasure inside the earth, which has no master or owner, belongs to the king of that realm. When the king wants to take possession of it, no one has the right to object. Bring that treasure soon and prepare for the celebration of the Yagas," commanded Lord Krishna [see also S.B. 10.72: 7-14]. 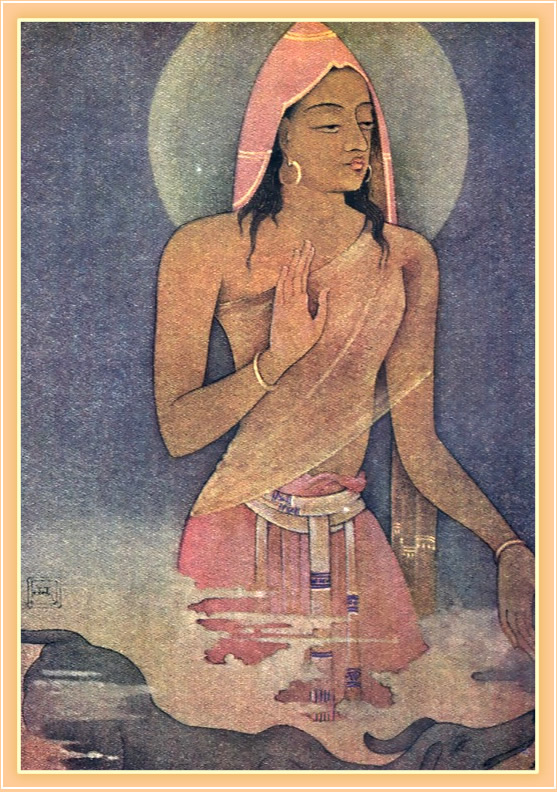 The picture is titled 'Yudhishthir' and is of Nanda Lâl Bose. Source: 'Myths of the Hindus and Buddhists', Ballantine Press, Oct. 1913.